The information presented on this page was originally released on January 27, 2005. It may not be outdated, but please search our site for more current information. If you plan to quote or reference this information in a publication, please check with the Extension specialist or author before proceeding. Despite recent weather ups and downs -- by the time you read this, the temperature may be 75 or 17 degrees -- be assured that planting time is not too far away. Consider planting in containers this season for a fun, new gardening experience. Even though I am always touting flowers and such, you may not be aware that in my younger days I was an if-you-can't-eat-it-don't-grow-it kind of guy. I also had the opportunity to work for a few years with the best container gardener in the world, Dr. Sam Cotner, who later became department head at Texas A & M.
He taught me that growing fresh produce for the picking doesn't always mean having an intensive garden, a square-foot garden, or an acre or more. It can be as simple and fun as growing a basket of cabbage or cherry tomatoes. We have used bushel baskets at my house for just about everything. They give a Southern, country-style feeling. They are available at farmer's markets for just a few cents in all sizes and colors. I have a couple of baskets in my office that resemble the tall bongo drums used in Ricky Ricardo's band. Bushel baskets are among the best disposable containers for growing all kinds of plants. They come with handles, naturally drain well, and look good on the porch, patio or deck. Try growing two or three cabbages in a basket, and maybe even place a small annual like alyssum in the pockets between the plants. Peppers also work well in a basket and can be inter-planted with leaf lettuce. For extra fun, try growing cherry tomatoes in a basket, and let the vines cascade out over the edge like you would a lantana or purple wave petunia. My son James still talks about the time we planted Irish potatoes in a large basket. This might be just the way to get your children started on their first gardening project. For a really awesome basket that will be the envy of fellow gardeners, try lettuce in a wire hanging basket. Line the basket with moist sphagnum moss. Fill the basket with a light potting soil. Place leaf lettuce transplants about 4 inches apart in holes throughout the basket. Push the root ball through the moss into the moist potting soil. Be sure to place several transplants in the top of the basket, too! Place the basket where it will get almost full sun. As the lettuce starts to grow, you will have an almost-perfectly round basket that is as pretty as an ivy or fern and a whole lot tastier. 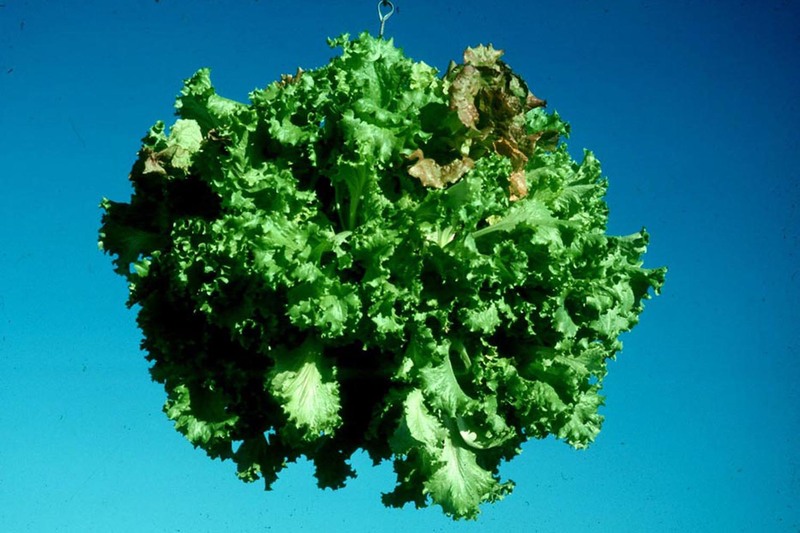 You can choose to alternate a green-leaf lettuce, like Black Seeded Simpson, with a red-leaf lettuce, like Red Sails, in your basket, or make a basket of each. If you have thought about growing herbs, but for some reason they still seem slightly mystical or just unknown, then try some in containers first. You could try some in a bushel basket where they would certainly do well. On the other hand, they look picture perfect in one of the Old World- or European-style containers. Which herbs should be your first? You should certainly consider which might be most useful in your kitchen, such as basil, rosemary, oregano or thyme. These four really look good in a container and will give season-long enjoyment. The fragrance of these herbs is an added bonus for the patio. This is only the surface of the fun that can be found growing veggies and herbs in containers. The options are almost endless. Just remember to provide a large enough container for the roots, a good light potting soil, and enough sun, water and fertilizer during the summer months. If it is freezing when you read this, don't despair -- warm weather is on the way.